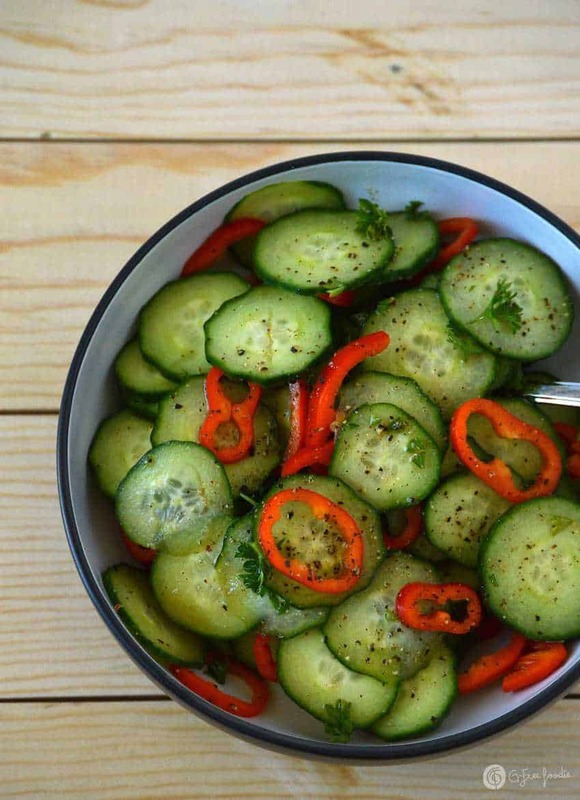 This Simple Cucumber Salad is packed with crunchy, fresh-from-the-garden flavor. It’s one of my favorite side dishes to make during the summer, a great companion to grilled meats, fish or pasta. 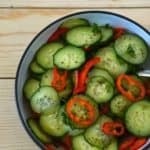 This simple cucumber salad is tasty right when you make it, but it’s even better after a couple of hours marinating in the fridge. You can serve the salad room temperature or cold, so I often pack it with me if I’m going someplace that might not have GF options. It’s perfect for BBQs and potlucks, and is a wedding + baby shower menu staple for me, since I can make it the day before. I grow English and Armenian cucumbers, so that’s what I use in this recipe, but any slicing cucumber will do just fine. If you’d like thinner slices, use a mandoline or handheld slicer. I like my slices a little thicker, since I usually make a double batch and leave some in the fridge for a day or two, so my trusty chef’s knife does just fine. If you’re avoiding soy, you could use coconut aminos – I’ve done it and it’s equally delicious. Sometimes I swap the parsley for basil and add some grape tomatoes too – the light dressing does wonders with any fresh veggies thanks to the rice vinegar and soy sauce. In a large bowl, thoroughly whisk the sesame oil, vinegar, tamari, pepper, salt and lemon juice to combine. Add the sliced cucumber, peppers and parsley, and stir to coat. Serve immediately, or store in an airtight contain in the refrigerator for up to 2 days. This entry was posted in Eat Your Greens, Quick & Easy, Recipes, Salads & Dressings, Side Dishes and tagged g-free diet, G-Free Foodie, gluten free, gluten free cooking, gluten free food, Salad, side dish. Bookmark the permalink.